When you are tempted, do not fall immediately to prayer. First utter some angry words against the [demon] who afflicts you. The quotation is found nestled into the middle pages of his treatise called The Praktikos, a practical work intended particularly for monks in the middle of their monastic journey. These were ascetics who one the one hand had already done the hard task of leaving home and family and entering the desert, but on the other had not yet endured long and patiently enough to attain apatheia, or tranquility of soul in the face of temptations. This “middle stage” of the monastic journey, I think, is somehow symbolic of our own spiritual path, or perhaps the human condition in general, stretched as we perpetually are between intention and attainment. I’ve been re-reading The Praktikos lately in preparation for a talk I’m giving tomorrow at the Mt. Andrey Sheptystky Institute, and I might just camp out in it as Lent nears. Composed of short numbered sayings and advisements that revolve around such topics as the passions, apatheia, and prayer, it’s one of those highly useful pastoral works that cuts right to the heart of universal spiritual battles. Back to the quotation above. One of the things I love about Evagrius is his knack for giving highly nuanced, situation-specific counsel. He doesn’t just resort to cookie-cutter, one-size-fits-all advice (“just pray,” “go to church more,” “just try harder”). Instead, he takes the time to observe each stumbling block in the monastic life in all its uniqueness before offering strategies to deal with it. As a result, you often encounter surprising suggestions, pieces of advice that run counter to our expectations, but which in the end up helping a lot. The context of the quotation I mention was the temptation of anger. Evagrius recognizes that praying while intoxicated by anger can actually just intensify our rage. It is often helpful to first work the anger out of our system. His rationale recalls’ Christ’s words to first reconcile conflicts with others before offering your gifts to God (Mt. 5:24). In any case. Uttering angry words at demons. Perhaps this was a necessary allowance, since the monks he was primarily writing for often lived at a distance from others, making prompt interpersonal reconciliation unfeasible. But perhaps his suggestion to dispell your anger on the demon was also his way of signal just how trivial and meaningless our offenses often are. How many of our personal slights are really worth bringing to other peoples’ attention? And even when anger is tied to legitimate concerns, it seems wise to wait until that volatile, intense anger subsides before trying to have a productive conversation about it. I don’t think anger is the only category of temptation in which resorting immediately to prayer may not be beneficial. I often find that, when I am deep in the trenches of some intense thought pattern, it’s best to get some distance between myself and the temptation before calling out to God. So I’ll go for a walk, or wash the dishes, or drink some tea, or knit a few rows. The hard edge of my thinking will start to dull, the temptation will recede a bit, and that is a good time to pray. It’s not that I don’t think God can’t take my prayers sooner, the ones that are all mixed in with my less-than-prayerful pettiness. It’s not that I think it will damage Him, but it might damage me a little. I don’t like who I am when I care more about my sadness or despondency or pride or anger than God. I don’t like how quickly my thoughts race in those moods, how everything becomes bound up with my own grievances, even prayer. It’s better, for a few moments, to step away from myself in those instances. Not for too long, but enough for some semblance of clarity to return. And it’s usually in the stepping away that prayer finds me–quietly, gently, like an old friend who knows just what not to say. I haven’t been reading your messages lately, but this one stopped me, and I will try to read them as you send them out. Time eternal is for me so wonderful a thought. You are very sensitive to the Holy Spirit. You’re always welcome. 🙂 Stop by any TIME. 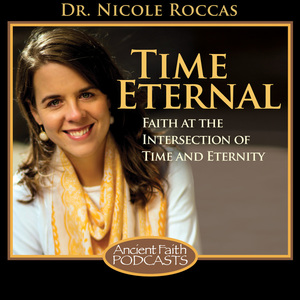 Thanks for sharing, Dr. Nicole. Yesterday, in the morning I read from the Philokalia a couple of pages about anger. In the afternoon, I was fighting to stop my anger for some petty perceived reasons which my ego kept to be offended about. By the grace of God, I kept my mouth shut and didn’t let my anger come out in words. In stead, I kept fighting with my self. (I wonder if Evagrius would call that rebuking the demon I was about to become 🙂 ). In the evening, I slept praying to the Lord to take away this anger. In the morning, the Lord gave me his grace and an opportunity to have nice conversations with the people against whom I was angry at just yesterday. And now, I just finished reading your blog. Hmmmmmmm! The Lord has his own ways of teaching. In less than 24 hours he taught me about anger more than I could have imagined. Don’t forget to share us the recorded lecture from the Institute of Sheptsky the great! God bless your work and your husband. Thanks Bridget! Yes, anger has been a stumbling block for me too recently, more so than usual. Which is why the advice really stuck out to me. Less the uttering angry words to demons part and more the permission to wait a bit before going to pray. I picture it like giving myself a bit of a time out, in a healthy/beneficial way not in a self-shaming way.